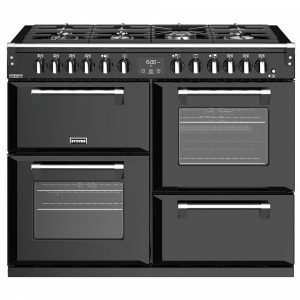 This fantastic 110cm range cooker from Stoves offers plenty of features so you can certainly cook up a storm. With an amazing 200 litres of capacity, there's room for even the biggest roast dinner. The impressive 7 burner gas hob boasts a Power Wok burner and single hand ignition for easy use. With Zeus bluetooth connectivity you can remotely check the time remaining or automatically set the clock and the clever Steam and Infuse cooking system allows you to create healthy and tasty steam cooked meals using the accessories provided. Finished in black you are certain to impress all guests with this cooker's stunning design and clever features. What is not to like about this fantastic 90cm wide range cooker from Bertazzoni? Featuring a multifunction oven and a five burner gas hob, there are plenty of options for every meal. Finished in sleek black it will create a real talking point in your kitchen. The energy efficiency rating on this model is A and it comes with a two year parts and labour warranty as standard. 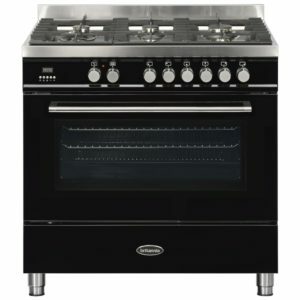 This attractive 90cm wide range style cooker from Britannia features a single electric oven and a six burner gas hob, ready for all the cooking you need to do. In a stylish black finish it will create a stunning focal point in your kitchen. The energy efficiency rating on this model is A and it comes with a two year parts and labour warranty as standard. 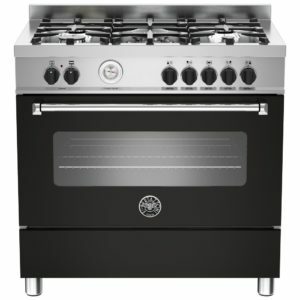 We love the brilliant combination of traditional design and modern cooking offered by the 110cm wide Elan Deluxe. 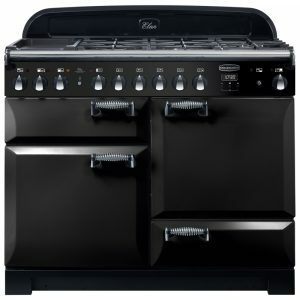 This striking black range cooker boasts beautiful design elements such as the spiral handles but is matched with two electric ovens, a separate glide-out grill and a five burner gas hob with ceramic warming zone. This dual fuel range cooker also comes with a 2 year warranty and with its A/A energy rating, it'll save you money on your energy bills too!